Button it all up and decided to spin the diff with a 1/2 drill using an adapter to fit the square end of the driveshaft. What I get is a noise from the ring gear and pinion. Remove drive shaft tube and rotate get noise. Remove complete driveshaft assembly and rotate either one and not a noise, smooth as silk. When I use a sharpy and mark the pinion I get only one contact point. Doesn't seem right to me, ring and pinion are new, FP pinion bearing kit, new axles, new thrustwashers. First measurement of backlash was .025" added a .015" ring gear shim and brought it down to .008/.010". Measured diff run out at .005"
Noise is consistent not sporadic. Pinion is not hitting ring gear bolts. Diff spins freely in case and when cases are bolted together, maybe .003 to .005" differential carrier movement in case. Not sure how I can correct a single point of contact so close to the edge of the pinion, any ideas? Does the driveshaft and pinion spin true? Not bent or wobbling? Phillip, on page 33 of Tinkerin' Tips Volume 2 there are some drawings of the markings you can get setting up the crown wheel and pinion. Your markings would suggest you do not have enough backlash. You could try a thinner shim behind the crown wheel and see if this improves the situation. After an hour or so of staring and wondering what is the issue I've concluded that the pinion gear is not deep enough into the ring gear or ring gear is manufactured incorrectly. I've double checked back lash and it was at .009", ring gear TIR is .005", differential case installed in left half, runout is .003" TIR. I installed one gasket between the pinion bearing housing and the noise (cogging) got worse. This leads me towards the pinion gear not is not deep enough into the ring gear. As of now I've completely dis-assembled the differential to check everything else. Pinion gear spins freely when installed in left case with no ring gear to mesh to. Ring gear housing spins freely and smoothly when no pinion gear in mesh, with both inner and outer bearings installed. Double checked the ring and pinion gears for burrs and don't feel that's the issue. When rotating the gears in reverse I can feel a grinding of some sort but not as much going forward direction. I don't have any prussian blue to check contact patch but will purchase asap. It looks to me that the ring gear is too close to the pinion and the pinion is not in far enough as you suspect. Your contact area is only at the tip end of the pinion. Is the driveshaft at right angles to the rear axle assembly? Are the interfaces clean, does it fit together nicely and are the pinion housing bolts uniformly tight? "Cogging" to me means there is interference between the teeth when they mesh. Yes to all your questions. I changed out the ring gear shim from a .015" to .010", back lash increased but the contact pattern is still on the tip of the pinion gear. Still cogs when rotating, worse if I rotate as if the car was going in reverse. Kinda late here but I had a few thoughts. 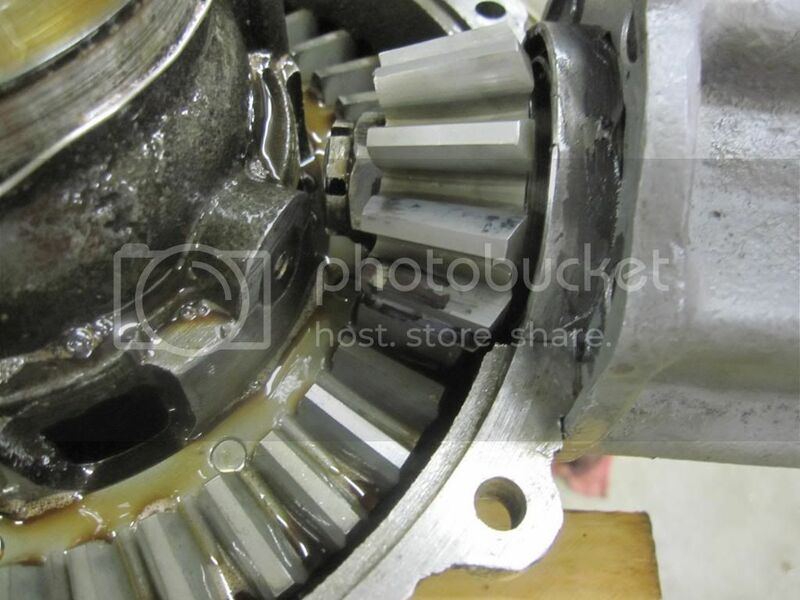 Usually cogging is felt when the pinion gear is inserted too far into the rear end housing and usually guys will drop a gasket between the spool and housing to back it out a hair and it goes away. Since you don't have the ujoint in place - look through the holes were the pin goes through the ujoint and see if the pin hole is centered front-to-back in the place where the plugs are located on each side of the ujoint end of the drive shaft housing. I don't see a cotter pin in the nut but it could just be out of the picture or is the cotter pin hole in the end of the driveshaft not visible to allow a cotter pin? Is the driveshaft a new one or the original? Finally measure diagonals with a tape measure to see if the distance is equal from tip of driveshaft ball to place where the radius rods go to see if the driveshaft housing or rear end housing has the driveshaft to one one side slightly and thus the pinion and ring not meeting at a right angle. It is really impossible to tell from looking at the computer monitor on this end what might be off since clearly it doesn't look to be a mile off. I did wonder if the nut was possibly hitting something. I always wonder with noises if perhaps the key is not fully seated in the keyway since that has been a known problem with new shafts in the past. Also the ujoint pin hole has been drilled in the wrong location on some new shafts awhile back but that wouldn't cause noise but might falsely make it look like the driveshaft is not located in the housing correctly. Let us know what parts are original since that may help us rule out what might be going on. I will check email in the morning but will be gone all day since our Turkey day celebration is tomorrow for our family gathering. Stan Howe has done more rear ends than anybody I know so maybe he can wade in here and help. 1. You shouldn't need a shim behind the ring gear if you have a new ring and pinion. 2. Are you using the original style pinion bearing? 3. When you set up your test rig like you have it, smack the pinion carrier a couple good whacks with a hammer to make sure it is seating into the boss for the pinion lip. Or put the other housing half on and draw up the center bolts tight, then tighten the pinion carrier bolts and remove the other housing. It can make an amazing difference in how the pinion gear and ring gear fit together. 4. Did you measure the thickness of the steel thrust washers on the ring gear side? A lot of them are worn far more than they appear to be worn. 5. How thick is your brass thrust washer? It should mic .200 on the ring gear side for starters at least. 6. Check the housing itself and the end of the ring gear carrier for wear. Often they are worn to the point where you have to put a shim being a washer. If the positioning pins were worn off or missing the housings is worn. You need to check the depth from the center parting line against a known good housing. 7. Anything less than .012 is too tight to try to set up the clearance. 8. Take a piece of soft solder and run it through the teeth. It will give you a better gauge of clearance than a a feeler gauge. 10. Install the radius rod and make sure the driveshaft is actually at a right angle to the axle center line. You can't just put the driveshaft tube in and count on that to hold it straight. 11. I dunno, could be something else besides any of this. 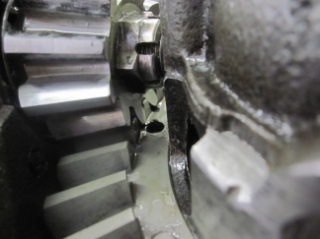 The contact pattern appears to indicate the pinion gear is not deep enough into the ring gear. In other words the pinion needs to move towards the rear of the car. This is consistent with what Stan is sayin on his point #9. Did you replace the driveshaft bushing? If so, did you spot face the bushing on the front? They are too thick the way they come out of the box. I think John and I were typing at the same time. Dave Huson has probably done more rear ends than I have ever seen but I have done quite a few. Maybe Dave will chime in here when he gets up from his Turkey day nap. In my #6, that should be "behind" instead of "being." Probably more mistakes in there too but I'm off to the shop so will let somebody else proofread. One other thought is that a lot of times there is a ridge in the housing or some scabs that won't let the pinion carrier seat in the housing all the way. When you are down to trying to fix .005 it doesn't take much of anything holding the pinion carrier crooked to keep the gears from meshing right. It still looks to me like the pinion is not in far enough. Thanks for the help, here are some answers. Driveshaft is original, I measured .005" TIR runout from top of each pinion gear tooth. No u-joint installed yet. Hole for u-joint pin is centered in hole. 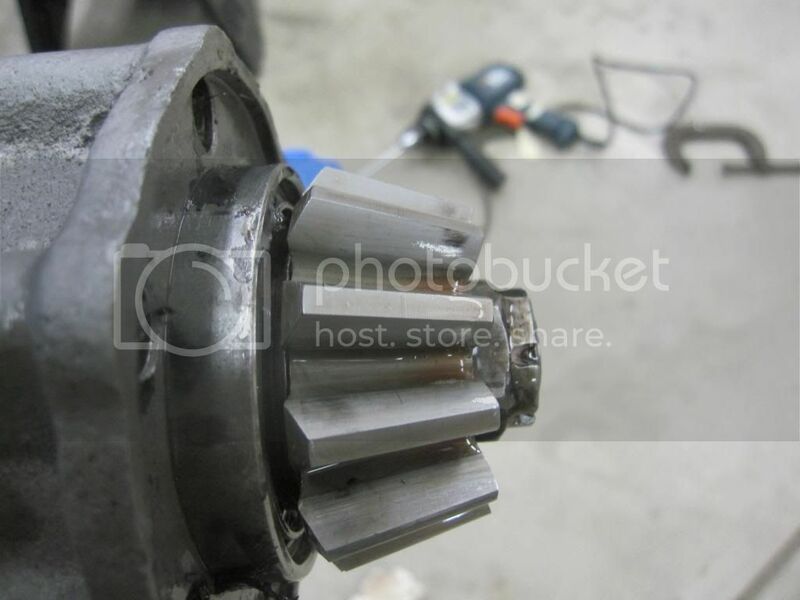 Driveshaft spins freely with FP pinion kit and once installed in driveshaft housing. I installed a new driveshaft bushing and honed to fit driveshaft end. If I separate the diff housing assembly and driveshaft assembly they both spin smooth with no noise. It's just when I put the two together is the issue. I removed the cotter key to eliminate it hitting the diff carrier. No excess casting remnants are hitting the pinion either. With the diff carrier assembly out and driveshaft assembly installed, no noise when driveshaft is turned. I lean towards the pinion gear not deep enough but to move the contact pattern to mid gear would take a lot in my opinion but then again I'm not a gear guy. I tried both shims, (.010" & .015") plus no shim and I still get that cogging noise. Spent fifteen minutes stoning the pinion gear teeth ends to remove some sharp corners, helped slightly. The difference between the non-adjustable and adjustable pinion set is that the adjustable comes with a set of arbor washers to move the pinion gear in further. There is a reason they sell that setup. Something is really weird here. The fact that the ujoint pin is centered in the plug hole says that the driveshaft is sitting pretty well were it should be. Since the driveshaft is original then I trust that hole to be in the correct spot in the driveshaft. Just looking at how far the gear is protruding beyond the driveshaft spool sleeve, it looks normal yet the gear appears not to be inserted far enough. Photo angles can really prove distorting to us so I wonder if you could somehow make a mark in the ring tooth and pinion tooth with a felt pen or something and then take some measurements of the teeth when separated so that you could determine if the pinion really needs to go in further since that would likely end up with the drive threaded end needing to be ground off to gain clearance and that just doesn't sound right. I think you absolutely ought to at least once put the radius rods in place at the axle and see if they indicate that the drive shaft housing is NOT square with the axle. I get really nervous when you want to add shims behind the pinion gear because the non adjustable kit puts the pinion gear within .005 of "true position" which is defined by the dimensions of all new original type parts. I have the factory drawings for all parts that affect pinion gear location and used all of that data to determine the pinion gear location and 100% of all spacers are tested in 3 places for length and parallelism. I just think something is going on here that isn't obvious yet and if you shim out the problem when it isn't something worn out - you will have a bigger problem down the road. I swear it looks almost as though the ring gear has the wrong Outside Diameter. Mark Auto has been making ring gears for a long time for Model T's so I have to think that it is just the photo angle that makes it look that way. I fully understand you really can't get the camera located to shoot a true side view. I think you need to let it sit for a day or two and then start fresh. Sometimes you can't see the forest for the trees and a little slack time can enable you to take a fresh look. Who's photo did Royce post ? Is this Philip's ? You state that you "installed a new d.s. bushing and honed to fit" - which is O.K. but as Royce posed the question; "did you spot face the bushing at the front" ? One can only determine the proper u-joint to shaft position when the u-joint is installed on the driveshaft/torque tube assembly as a unit, bolted to the housings and THEN determine if the pin will in fact, go into both. I copied the photo from Philip's Photobucket page because a year from now Philip may not have the picture on his Photobucket but the one I posted will still be here. Since Philip has not installed the U-joint yet I bet the drive shaft bushing has never been spot faced, and it will not allow the U-joint to be inserted far enough to be able to install the rivet. In any case the wear pattern shows the pinion gear is not deep enough into the differential ring gear. I have to shim them to fix that problem. After that you may have to cut the castellated nut deeper to be able to install a cotter pin. I think Stan has the answer. There shouldn't be a shim behind the ring gear. That pushes it too far toward the center and is causing too tight of a lash with the pinion gear. After removing that shim, if the lash is too large, then the d/s bushing could be faced or the pinion gear shimmed to move the pinion gear closer to the ring gear. Yes I turned the face of the drive shaft bushing since it was not needed for controlling pinion movement. U-joint isn't installed anyway so it's not the problem. I spent this morning adding shims the pinion carrier to see if pinion to ring gear geometry is out of whack but no luck. I did notice that the leading side wear pattern is near the pinion carrier while the trailing side is in the front near the ring gear carrier. This tells me that the geometry is not correct. When I try to adjust it by trying shims, nothing changes in regards to the noise. The picture Royce posted would be the trailing side of the tooth if the car was going forward. I'm giving it a rest for now, still need to clean and paint the rear spring. Removed the ring gear shim last night and same issue, plenty of back lash but still have the cogging issue. How does this look for engagement? Clogging noise indicates the there is not sufficient engagement between the pinion and the ring gear. Drive shaft position is fine as per your recent photo. I will predict that another .oo5 added to your ring gear side bronze washer bearing will remove this condition. When I set them up, I machine the bronze washer to allow for either .010 or .015 washer shims on the ring gear side, so that I can adjust this. I wonder if the axle housing is bent. I disassembled the FP pinion setup and added a .015" shim to the back of the pinion and same issue. This time I assembled both housing halves and same issue. Moving the pinion back toward the center of the diff housing did nothing but waste a half hour of my time. I'm using ring gear shims, right now I have a .010", I can try the .015 again but I don't think it will help. I'll come back after dinner and ponder the problem some more. You need to check the tooth contact with white lead paint. I use Competition Cam's Assembly Lube. It works much better than the thin stuff that is supplied with late model gear sets. Prussian Blue will work too. Hang in there Phillip...this ain't rocket science. Problem is not the pinion. Install the .015 ring gear shim in place of .010. If not satisfactory then install .020 shims. Note that anything you add to the drive side must be removed from the passenger side. When assembled, there should clearly be a drag on the rotation of the axle assembly, but not so much that you cannot move the assembly by pushing the ring gear with your thumb. Here is a video of the current setup. With the .015 shim added to the pinion and the .010 ring gear shim. Insufficient engagement. Have you tried running a piece of solder through as Stan suggested? You have to have an outer bearing to hold it in place, otherwise the axle will wobble around. Put the sleeve and bearing in and put one of the old style caps on the end. Cut a couple slots in it and clamp it on with a radiator hose clamp. You have to have both the inner and outer sleeve and bearing in place before you can set the clearances. Absolutely insufficient engagement. I can't tell how much you'll need to move the ring gear towards center, but that's your problem. Once the this correct shim stack-up is determined, you may need to machine a custom bronze washer so you don't have a shim stack taller than your anti-rotation pins. This assembly coasts too easy which tells me you da not have correct side preload (see previous comments about rotational drag). In your video it appears that you are only using 2 nuts at 180 degree opposite positions to hold the pinion spool to the housing. That might be my error if the nuts are painted black. I wish I could convince you that adding .015 shim behind the pinion gear is moving the pinion gear for sure away from the correct position by that amount. Since stock setup can be as far as .020 off when supplied with regular Hyatt bearing and thrust bearings, you are within range of a typical Ford setup but I honestly don't think that shimming the pinion gear is moving you in the right direction. I have 5 T's and none of them have any shims in the pinion gear setup added behind the gear. My question about the ujoint pin hole position earlier was simply a "sanity check" to make sure that the drive shaft at least appeared to be in a reasonably accurate position in the drive shaft/spool assembly and you verified that it is reasonable since you stated that the pin hole in the drive shaft was pretty much centered in the plug hole of the drive shaft housing. Some mention was made of the set screw on the collar rubbing the inside of the drive shaft housing. That is addressed in the instructions and there should be ample clearance if the seam weld of the shaft tube was reduced and the early spool centers pretty well on the drive shaft housing so this is only a problem if the weld protusion is large which it sometimes is. If the set screw were hitting, you would hear it anytime the drive shaft was turned and you have stated that the drive shaft assembly alone is quiet when turned. I assume that is still the case. I am full of turkey and kinda sleepy right now since we had our Turkey day yesterday and I slept in this morning. .015" behind pinion was a test to see in anything improved which it didn't. Shim is coming out. No hitting of collar on the inside of drive shaft tube, hole for u-joint pin is centered in drive shaft housing. The drive shaft spins freely inside the housing. Your kit is not the issue. I am here to help regardless of the issue but just wanted to share with you the rationale of why I didn't want you to move the pinion that way. In any problem even electrical the base one has to work from is what "for sure" is not part of the problem. Otherwise there are too many variables to ever get something going. Listen carefully to those who have actually built a lot of rear ends and that list does NOT include me. I have built a few but many of my customers have built a ton more rear ends than I have and they have seen all sorts of things that I have never witnessed. I promise them a faithfully made part that is hopefully identical to the last one they got from me. Having confidence in your sources has a lot to do with resolving issues. Feel free to send me an email, phone call, or PM if you want to. I am just building some coils today and will be in the shop. As of right now I have a pinion per the FP kit directions and a .010" shim under the ring gear. Both the ring gear and shims are from Langs. Used the MTFCA manual by Glen Chaffin - measured, checked everything it said to. Used two pieces of solder (one thick, one thin) and came up with .010" to .012" when running through gear mesh. I'm out of time for this weekend as my wife just called to tell me my truck won't start. So I need to clean up and get home. Will work on the issue in a couple of weeks.